E and S Rock, the combined vision and efforts of Bill Ernst, Terry Snelling and their families began after months and years of conversations, dreams, and planning. Bill, with a lifelong passion for rock and rock production had the ideas, the dreams and a thorough understanding of market. Terry brought engineering expertise, a lifelong knowledge of asphalt, aggregate and ready mix production as well as a long history in the heavy construction industry to the venture and the E and S partnership was born. The combined commitment made to the partnership, the long planning, was successful with our first production of aggregates in June 2012. During our short existence we have provided the City's, Counties, Contractors, Farmers and Homeowners in our community with quality rock products at a fair price. We are proud that our employees are all residents of the communities we serve and each takes a special pride in their work effort and the products they manufacture. We have the best people, the best products, and the best customers. The Anstines, Rick, Jeremy and families were instrumental in the forming of E & S Rock. 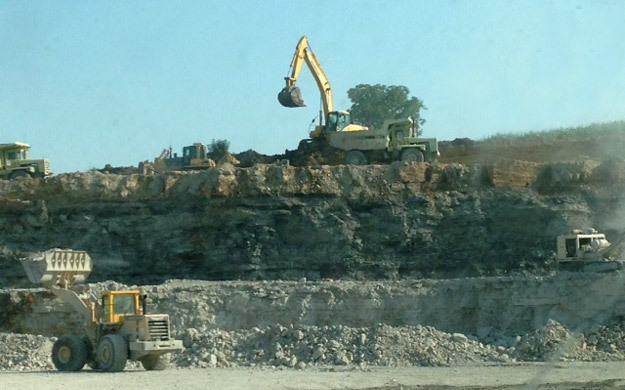 The quarry, located on 2 Hwy on property owned by the Anstine family carrys the name of "Anstine Quarry" in appreciation of their belief, commitment and assistance in bringing our dream to a reality. Copyright © 2013-2019 E&S Rock. All Rights Reserved.